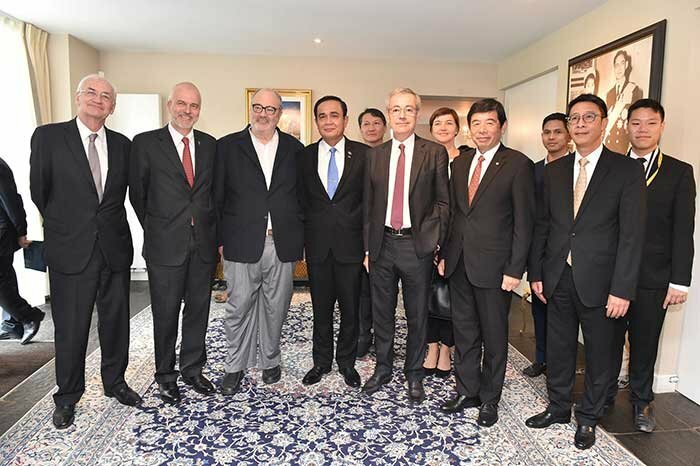 BRUSSELS, 19th October 2018 (NNT) – The Prime Minister has met Thai citizens living in Belgium ahead of taking part in the 12th Asia-Europe Meeting (ASEM) and EU-ASEAN Leaders’ Meeting. Prime Minister Gen Prayut Chan-ocha was greeted by Thai citizens residing in the Belgian capital Brussels, as he arrived at his hotel in the city, receiving a bouquet of flowers and chocolates as well as personally grown vegetables from them. Addressing the crowd, the PM expressed his happiness at their presence and asked them not to pay attention to much of the distorted information being circulated internationally, stating that solving the Kingdom’s problems is complicated and requires an overhaul of its education, economy and connectivity. He assured them that his priority is maintaining peace and order. The PM afterwards met and handed out policy decisions to members of the Thai team taking part in the 3rd Asia-Europe Youth Leaders’ Meeting at the Thai Embassy in Brussels. Minister of Foreign Affairs Don Poramudwinai said his and the Prime Minister’s presence in Belgium provided a good opportunity to explain the nation’s road map and current political situation. The 12th ASEM is being held on the central topic “Europe and Asia: Global Partnerships for Global Challenges”. It is being attended by leaders of 51 countries and personnel of both the European Union and the Office of the ASEAN Secretary-General. Director-General of the Department of Information and Ministry of Foreign Affairs Spokesperson, Busadee Santipitak said today that ASEM provides a good opportunity for Thailand to enhance its role on the world stage, saying that the PM’s key address will outline a vision of cooperation, sustainable network building and support for the United Nations’ Sustainable Development Goals. He is also to seek multilateral cooperation on regional issues during informal meetings. After ASEM, the PM is to attend the European Union-ASEAN Leaders’ Meeting to discuss EU-ASEAN cooperation and Thailand’s role as chair of the bloc in 2019. He is also to hold bilateral meetings with several national leaders.